(Aug 4, 2013) Tony S said:Wonderful insight there from Gareth - and much appreciated. I remember the shop, and his brother Roger very well indeed. As a music lover and already a serious audiophile in my teens, I truly appreciated both the reasonable prices and customer service afforded by Treble Clef. This was one of the few shops, when some labels' pressing quality went through the floor in the late 1970s, who would calmly and persistently return bad pressings to the record companies, until their customers received something playable. Gareth's connections (not least with Polygram) explain how come I ended-up almost worshiping Roger for his ability to source relatively obscure and rare material. Even more delighted when, in the late 1970s, Roger opened a second-hand section (no scratches allowed!) which became an additional delight as my taste for late 60s and early 70s music increased, but funds were still limited. The shop served its customers well in many ways, not least also the range of good quality inner-sleeves, record care accessories and a very respectable range of both "ordinary record player" and hi-fi replacement styli (needles!). Only took my business elsewhere in 84 when I (foolishly) moved away from London. Still visited (and bought records!) when I came back to visit the aging parents. The goos people of Sydenham were very well served indeed by this well-stocked, well-run and very amiable family business - I had wondered whether it was a Chart Shop - thanks for confirming! Greedy record labels choosing to sell discount copies of mainstream material to supermarkets, plus a very limited choice offered by places like HMV have served not only to destroy a whole network of good record shops, but also to deprive the buying public on many levels, from being able to go listen to a range of things on a Saturday morning (or whenever) before buying, right through to the friendship and camaraderie which developed both over the counter and, on occasion, among other music lovers in the shop. (May 20, 2013) Gareth Harris said:Treble Clef opened in 1973. I acquired the business, then called The Record Forum, from a Mr Chapman who wanted to retire. The shop was managed, variously over time, by my wife, Helen, my son James and my brother Roger. I had worked for WH Smith for several years in their record departments, rising to Head Office staff working with the wonderful Joanna Smith. By 1973 I was working for Polydor Records so only worked on Saturdays at the shop. Helen had also previously worked for WH Smiths record department - we met at the Bromley shop - and she later went on to open and run the first HMV shop in Bromley [situated in The Mall] before we opened Treble Clef. 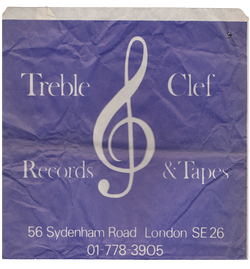 We enjoyed many years of success as Treble Clef but later changed the name to 'Sound Store' - see other entry. Apart from feeling that we needed a more 'modern' name it also reflected the difficulty that customers had in spelling and writing out cheques to Treble Clef! We had a good reputation, I believe - switched on and knowledgeable staff - we were also a Chart Shop. Although this was meant to be 'secret' it brought some advantages. Unfortunately the shop closed in 1996; savage price cutting by the entry of the Supermarkets made it hard to compete for small independents - plus the big new Sainsbury's Hypermarket opened at the bottom of Sydenham High Road taking away much of the High Street footfall. Coupled with this, the local council introduced yellow lines along the High Street and side roads inhibiting the quick passing trade that would often stop briefly. Getting a ticket made it an expensive stop!. Nevertheless, it was a wonderful 23 years and my family and I enjoyed meeting some delightful people in Sydenham. ( Feb 24, 2016) Hi there, I used to visit your shop on a regular basis. I remember trying to obtain the very first Street Sounds Electro album, and after many weeks, you finally managed to get it for me. Could you tell me, you used to have a chart on a clipboard which I would come and stare at every week? I remember this most clearly circa 82/83 where I would follow the soul and funk chart. I think you cut it from a magazine for our perusal, what was the publication called? I seem to remember there was also an Indie chart too. I am trying to jog my memory of tracks that were around at that time. Great memories from my youth. All the best, S.